Here are just some of the Spring/Summer 2010 collection bags from Guess. 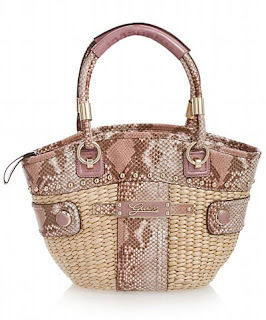 This summer bag has woven sea-grass exterior with python and Quatro G logo jacquard trim with metal trim available at http://www.guess.com. Bag lovers for sure will be thrilled to see these collection and I can hear the sound of barcode scanner while you are making your purchase. I personally like the tulip tote as it looks so versatile, Can be worn while shopping or when you're at the beach.